I was listening to my favorite podcast Radio Cherry Bombe last week and heard an incredible woman's truly heartbreaking story about losing her 4 year old son to pediatric cancer. Somehow, through it all, her and her husband remained functioning human beings who have done incredible things in this world. I can't even imagine what kind of strength and character it takes to pick yourself back up after such a tragic loss. Together they started a non-profit organization in their son's memory called Cookies For Kids Cancer. How they did all this ON TOP OF THEIR DAY JOBS is mind blowing to me. When I heard about this organization that is fighting pediatric cancer AND raises money through food, I couldn't not get involved. They're trying to raise 250,000 by December 30th because every dollar donated from now until then is being matched. I set an aggressive goal of trying to raise $2,500 by then and I'm hoping you can help me get there. $1, $5, $20... anything helps. Please consider donating to this amazing cause. In honor of Gretchen's son Liam's favorite cookie flavor, lemon, I created this shortbread cookie recipe. 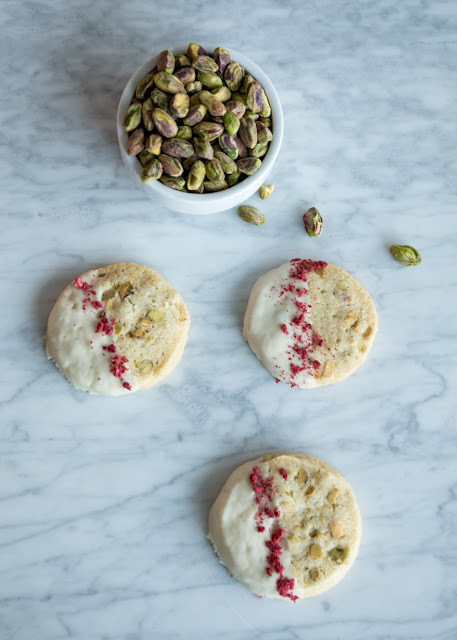 It's crunchy, slightly sweet and subtly nods to the festivity of the season with a vibrant red raspberry dusting over white chocolate and green pistachio flecks. The best part, this recipe is incredibly easy to improvise AND can be made with ingredients you likely already have at home. In the spirit of the holidays, I hope you join me in trying to raise as much awareness and money as we possibly can for children fighting this terrible disease. Besides, who doesn't love a good cookie?! 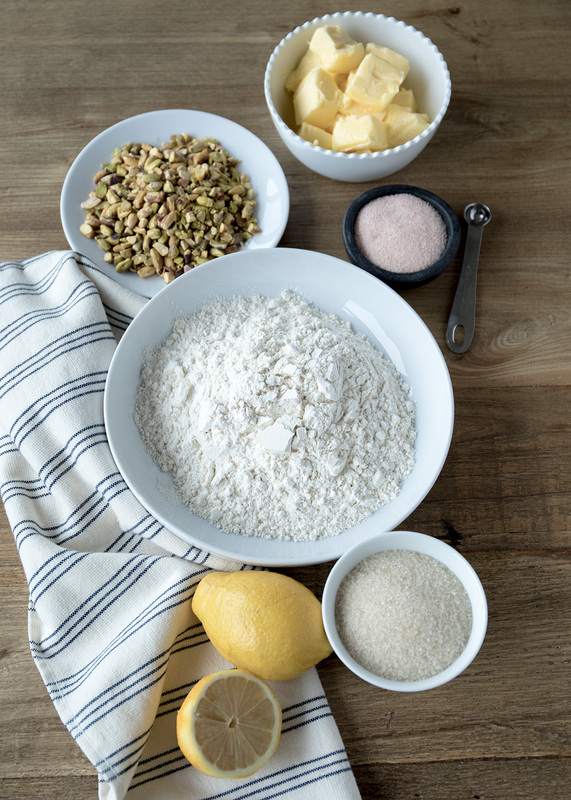 In a medium mixing bowl (or your stand mixer bowl) add butter, sugar, salt, vanilla, lemon juice and zest and mix on low until just incorporated. You want to make sure you don't whip your butter until it's light and fluffy as this will cause your cookies to spread too much when you bake them. Scrape down the sides and add your chopped pistachios to the mix, stir to combine. Add all the flour at once and mix on low until all of the batter is incorporated and it pulls away from the sides of the bowl. On a floured surface, dump out your dough and divide into two even balls. Roll both of the dough chuncks into a circular log about 3" thick. Wrap in plastic wrap and place in the refrigerator for at least 2 hours, up to 3 days. This is another important step as you need the butter to completely solidify in order for the cookies not to spread too much when baking. Line your baking sheet with parchment paper and take your dough out of the refrigerator. With a knife, slice the cookies into round coins between ¼ - ½" in thickness. I like a slightly thicker shortbread but this is up to you. Place your rounds on the baking sheet with at least 1" between the cookies. Place your cookies back in the refrigerator for 20 minutes to re-firm the butter up. Bake at 325º F for about 20 minutes until slightly golden but not too dark around the edges. I would start checking them around 16 minutes. Depending on your oven they might take a little more or little less time but I found 20 minutes on the dot was perfect. Transfer to a cooling rack. Once cookies are completely cool, in a small saucepan combine the coconut oil, white chocolate and lemon essential oil over medium heat. Stir frequently until thoroughly melted. 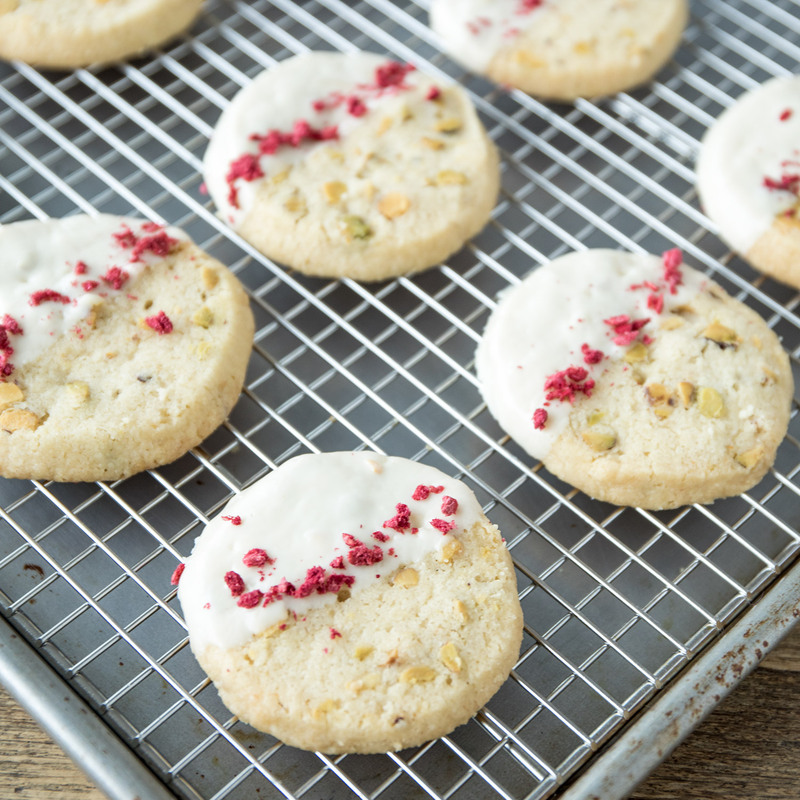 Dip half of your cookies in the white chocolate mixture and place on parchment paper or a cooling rack to dry. After you've done a few rows, sprinkle with raspberry dust and let cool completely (about 2 hours). I like to firm them up extra by putting them in the refrigerator for about an hour too. In my hot kitchen (from the oven) the white chocolate never seems to fully set until I do this. shortbread cookies are the perfect thing to improvise! just make sure you keep the quantities the same (1 c. nuts and liquid levels the same). if you don't have essential oil for your white chocolate, that's ok. you can skip it or add lemon zest over the top of the cookies while the chocolate dries. i like that the essential oil breaks up the extreme sweetness of the white chocolate - it all balances it out! Use other parts of the body - If your leg is injured, try working out in a chair, lifting down payment on new construction your arms to help you still move and increase your heart rate. A free-standing organizer will store significantly additional tools than a wall-mounted one. during this means, you will be able to keep all large yard hotel accommodation lake como tools in one a part of your garage or work search tool eqiupment. A free-standing organizer will store significantly additional tools than a wall-mounted one. during this means, you will be able to keep all large yard toronto loan program tools in one a part of your garage or work search tool eqiupment. Fantastic picture look like a greetings card.It's really amazing me.Thank you so much for sharing such a beautiful picture.It made me to learn photography.Actually i want to study photography.But mu home town there have no much facility. yes you are right. I feel so joyful today because of the help Doctor Ogudugu has rendered to me getting my Husband back. I've been married for 6 years and it has been so terrible because my husband was cheating on me and was seeking for a divorce. But when i came across Doctor Ogudugu Email on the internet posted by a lady, i decided to get in touch with him and i explained my situation to him and then seek his help but to my greatest surprise he told me that he will help me with my case for there is no problem without a solution. Here i am celebrating because my Husband is back home and am really enjoying my marriage and what a great celebration.